The Russian ruble has strengthened to a point where it is actually too strong, Russian Finance Minister Anton Siluanov said on Friday during a lecture in St. Petersburg. “What happened was expected: the volume of gold reserves stabilized, then the ruble started stabilizing and has now strengthened. We believe that it has strengthened excessively,” Siluanov said at a lecture in St Petersburg. On Friday, the ruble gained 1.22 percent against the dollar, trading at 51.37 at 5:00pm in Moscow. After gaining a record 15 percent in the first three months of 2015, the ruble has begun to weaken, which the Central Bank sees as a good sign. The regulator is trying to reverse the gains the currency picked up this year. 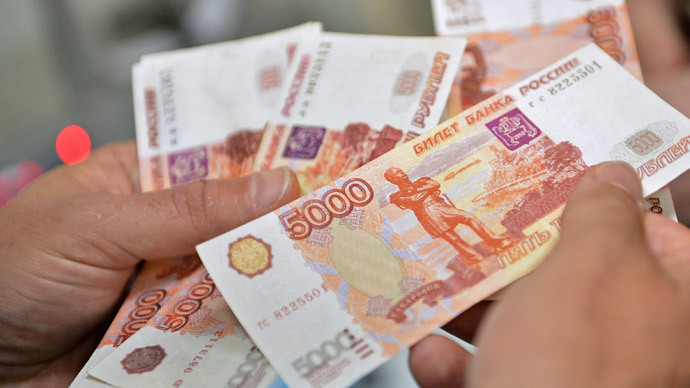 However, a stronger ruble could pose problems for exporters who benefit from a weaker currency. At stake is also Russia’s project of import substitution; as the ruble gets stronger customers have more purchasing power to buy foreign goods. The rapid rise has been spurred by higher oil prices as well as more solid internal economic factors in Russia, such as demand for rubles to buy attractive Russian sovereign debt and the ceasefire in Ukraine. It is the world’s best performing currency of 2015 so far, according to Bloomberg. In 2014, the currency lost 46 percent of its value, hitting an all-time low of 80 against the US dollar on December 16. The ruble nosedive was in tandem with oil prices, as well as panic that sanctions and low oil prices would negatively affect the Russian economy. At the same lecture on Friday, the Finance Minister spoke on Russia’s strengthening economic relationship with China, including boosting trade as well as the joint project to develop a route to speed up trade, dubbed the new Silk Road. Inflation for 2015 is forecast to be 12.2 percent, according to the Finance Ministry.